Note: These are excellent books, and brand new books, Not “on sale” books. How does understanding the heart of God release you into deeper levels of the prophetic? I am convinced that when the love of God is allowed to flow through our hearts by the Holy Spirit, we will see a generation represent Christ to the world with love, truth and grace. The Workbook is purposefully designed to activate and bring a deeper understanding of the prophetic. Accompanied with the ‘The Heart of the Prophetic’, this workbook is perfect for training individuals and groups that have a desire to have a greater revelation of God’s heart and the prophetic. Ivan takes you on a journey that will unlock your ability to hear God’s voice, and with this workbook you are given questions and activations to help guide and equip you. Also included is a bonus ‘The Heart of the Prophetic Journal’, so that you can take what you are learning directly into an encounter with the voice of God. 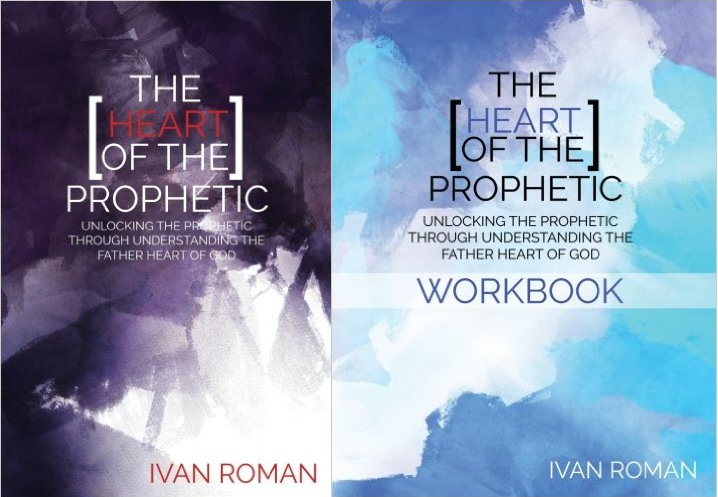 Ivan’s knowledge and experience in the prophetic will help you and your church go to the next level in hearing the voice of God. Ivan Roman is a revivalist, prophetic teacher and senior leader at Empowered Life Church in Medford, Oregon. Ivan has a Master's Degree in Theology and has studied at the Bethel Supernatural School of Ministry in Redding, California. He travels both locally and internationally, ministering in bible schools, conferences and churches. Ivan has a heart to see God's kingdom demonstrated in everyday living.